HomeMedia and NewsConscious Life Festival 2018 Review – The Most Magic You’ll Find On The Sunshine Coast! 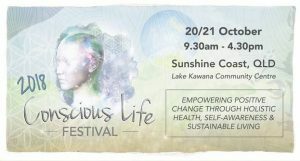 Here’s a belated writeup of the Conscious Life Festival, run by our amazing friend Laura di Mambro (a Master 33/6 Lifepath) on the Sunshine Coast. Kris and I have attended many of Laura’s events over the years. She has the most switched-on team of Angels in human form you could wish for. I have always been impressed by the quality and friendliness of everyone I meet at her talks and workshops, and her desire to transform the world is truly spectacular. She’s definitely an 11:11 Starseed to the core, who sees repeating numbers. I met Mary Rodwell (ACERN) through her. Some people say Master Numbers (11/22/33/44), especially 33’s, are very connected to ET’s, Starseeds and shamanism. A number of my favourite spots on the Coast have 33 numerology (see the system), e.g. Eumundi (home of the Eumundi markets) and Mapleton. Their vibration is amazing. -I talked to a Master 33 (Renee) about how Master Numbers need to do things twice as slowly or there’s chaos. A second later, the fire alarm went off and we evacuated! 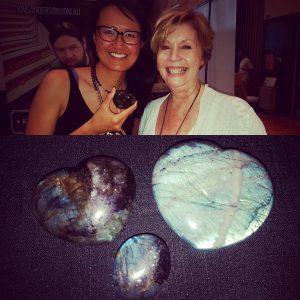 She ended up having two readings from me (after we had lunch and I had an incredible Reiki session from Faye Wenke and her team). I have a recording of Renee’s reading where I say ‘chaos’ and you can hear the siren straightaway. Here’s the extra amusing part – when I was about to start on this article today, the fire alarm went off in Chermside Library where I’m working and…we had to evacuate. Talk about deja vu. Ah, Mercury retrograde…how I love your sense of humour Spirit Guides. – I joked to a group of people that ‘they might as well move back to Victoria’ if the weather in Queensland stayed rainy and they nodded. I said ‘waaait, do you all come from there?’ and they said yes. -I gave examples of 25/7 and 34/7’s in my talk, and the next people who spoke were 25/7 and 34/7 lifepaths. It’s great to trust your intuition, as you connect with people so much faster. Here’s a meditation to help you restore your wings. -I said to a client, ‘I see a clock, you’re in the right place at the right time’, just as Kris said to his client, ‘it’s perfect timing’. We really are Soulmates in sync. Read more about 11:11, Twin Flames and Soulmates (Kris and I just ran a workshop on this topic on 11/11/2018 with Bayside Red Tent). -Julie (see pic) had no ‘6’s in her charts, so I brought out a crystal, saying ‘get a Labradorite heart like this to open your third eye’. She said ‘what, like the one I just bought from over there? !’ Yep. I got out-psychic’d. Funny, I had joked about meeting an astrologer, then she sat down and I realised she was…an astrologer. The rocks looked the same, it’s just my flash illuminated the one on the right. Kris and I not only sold out all our reading spots, we met many new friends and felt so at home. Thanks Laura and team for creating something very special, Queensland really is a hotspot for 11:11 awakening! The more you follow the 11:11’s, the more your life will be like ours…keep glowing folks.